The dual-channel 397 systems breaks new ground in universal waveform generator design. With its unprecedented combination of universal generator and synthesizer, versatility, high resolution and wide frequency range, and extremely good performance-to-price ratio, the 397s offer a range of benefits that will facilitate work in many fields. 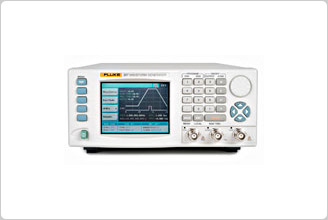 The Fluke 397 dual channel arbitrary waveform generator breaks new ground in value. This high performance signal source features an unprecedented combination of vertical resolution, memory depth and sample rate. 14-bit resolution. The 14-bit resolution provides 16,384 output levels to generate audio waveforms with excellent fidelity. It also allows video and other complex waveforms to be generated with small details superimposed on large signals. Fast sample rate. The 125 MS/s sample rate translates into excellent performance at high frequencies, meeting the requirements of demanding applications like telecommunications, radar, ultrasonic and audio and video communication. Deep memory. The 397 offers 4 MB word memory, which can be divided into as many as 2048 segments. When combined with the 14-bit vertical resolution and sample rate, the 397 offers enormous flexibility and power for creating custom complex arbitrary waveforms. Standard waveforms. Output frequency range is 100 mHz to 50 MHz for sine, square and up to 12.5 MHz for triangle, pulse/ramps, Gausian pulse, exponential decaying/rising pulse and sine(x)/x standard waveforms with random noise and a dc source. Output amplitude range can be adjusted from 10 mV to 10 V p-p into 50 Ω within a ±5 V window. The 397 generator is also equipped with a SYNC/Marker output. Available in all modes, the output generates pulses synchronous with the output waveform or in FM and sweep modes the output generates a marker at designated sample clock frequencies. A multi-instrument synchronization connector is provided to synchronize one master instrument to multiple slave units, thereby creating a multi-channel fully synchronized and jitter-free system. ArbExplorer Software for Windows® is included as standard for automated test application and simplifying arbitrary waveform creation and editing. The 397 has IEEE 488.2, USB and 10/100 Ethernet. Dual channels. The 397 is a dual channel arbitrary waveform generator with two channels that share a single sample clock in order to provide tight control over inter-channel synchronization and leading edge start phase, the initial skew between two channels is just a few nanoseconds. Each channel can be controlled separately to generate different waveform, amplitude and waveforms sequence. The 2-channel output signal’s inter-channel operation is controlled by two parameters: leading edge offset, which causes the edge of channel 2 to trail channel 1 by a programmable number of points; and channel 2 sample clock divider, which divides the sample clock source to channel 2 from 1 to 64 k.
The sample clock can be frequency modulated by standard or arbitrary waveforms. User defined modulating arbitrary waveforms can be of any shape from 10 to 20 k points and sampled at a rate up to 2 MS/s. The 397 also generates FSK and ramped FSK and linear or logarithmic sweep outputs. Output waveforms are generated in normal (continuous), triggered, counted burst and gated operating modes. Trigger source can be either internal (100 mHz to 2 MHz) or external TTL, positive or negative 2 MHz to dc signal. Sequence generator. When the sequencing facilities are invoked, the 397 becomes truly unique. The memory segments can be linked and repeated in any combination, both manually and under programmed control. Additional versatility is obtained by using the independent sequencing on the two channels. In the automatic advanced mode, the complete sequence runs continuously and automatically under the control of a pre-programmed table. In the stepped sequence-advance mode, the current segment is looped continuously until a trigger is received, when the next segment is invoked. The single sequence advance mode runs the current segment once only, and then idles until the next trigger is received. Frequency sweep: Manual, continuous, triggered; linear or logarithmic sweep; up or down. Variable sweep marker. Ref clock in Input for an external 10 MHz reference clock. Threshold nominally TTL level. SCLK output, SCLK input and DSUB connector Connect instruments to achieve synchronization. DSUB 9- pin connector and cable supplied. Inter-channel modulation The waveform from any channel may be used to amplitude modulate (AM) the adjacent instrument/channel. Alternatively, any number of channels may be modulated (AM) with the signal at the modulation input socket. 397: Both channels are tightly synchronized in phase and waveform start. Channel 2 has sample clock divider for arbitrary and sequenced waveforms. Inter-instrument synchronization Two or more instrument may be slaved to one master instrument. Each Slave can have a unique phase Resolution: relative to the Master. Waveform Software ArbExplorer Software for Windows is supplied with each instrument. This provides full waveform creation, editing and management including an equation editor, clipboard import/export and freehand drawing. Questions regarding Service, General Metrology, Certificates of Calibration or if you are in need of Technical Support can be submitted via our Support Request form.